Oh, Yes, The Mark Of The Beast Is Coming Soon. And The World Is Already Warming Up Nicely As It Prepares To Descend Into A Very Hot HELL. Hmm, it’s only been about three weeks since I had good cause to point out that the mark of the beast – as prophesied in Revelation 13:16-17 – is at hand. That last warning occurred in Venezuela, but it will be here soon as drought along with our OWN stupid and immoral socialism causes famines and empty shelves across our own land: they are fingerprinting people to keep them from being able to buy groceries. Literally, they are controlling the sale of freaking BREAD just as the Bible said would happen. Ultimately, when the mark of the beast is fully implemented as the Bible describes, no one will be able to either buy or sell anything without the government’s say-so. If you do not have the mark of the beast on your right hand or on your forehead, you will be completely shut out of the economy. That means that cash/coin money will no longer exist; that means that decentralized credit cards will no longer exist; that means that the government will have to have implemented a truly digitized currency system and have total control of the population’s access to that system. The world during the reign of Emperor Obama has massively increased the velocity with which the Antichrist, the beast of Revelation, is coming. Jesus spoke of wars and rumors and wars. Where was He when He warned us of this sign of the very last days? In Jerusalem. What’s that region of the world look like under the reign of Obama? Awful and very quickly getting worse and worse. “Wars and rumors of wars” is an UNDERSTATEMENT today. An earlier version of this article misstated the name of a company that had previously been hacked. It is Sally Beauty, not Sally’s Beauty. The issue has been what mechanism would trigger the complete abandonment of cash/coin currency, credit cards, etc. as personally and privately-administered financial transaction services in order to embrace this totalitarian governmental system. Who would we get “there” from “here”? Many Christian thinkers have been predicting all along that the mechanism would be rampant fraud. As big of a problem as fraud has always been given the counterfeiting of paper currency, what we are seeing today with cashless systems has been categorically worse. And as more and more people weary of having their identities stolen and their assets electronically drained, they will be willing to accept the government stepping in and truly taking control of the money supply and the means to buy and sell. And the Antichrist will exploit the new financial system to his demonic political and religious agenda. It will literally be the hallmark – the MARK – of his big-government system. God – who knows the end from the beginning – declared it in His Word. And it WILL happen precisely as God told us it would happen. We’re watching the same deterioration of freedom in America that the Bible told us would have to happen for the Mark of the Beast to become a reality. The Democrat Party – particularly in the person and presidency of Barack Obama – has officially demonstrated an abject contempt for the United States Constitution. Barack Obama has been slapped down by the Supreme Court in UNANIMOUS DECISIONS THIRTEEN TIMES in his thug presidency. But Obama and his Democrat Party are FASCIST and they simply do not give a damn about the Constitution or anything that in any way gets between them and the fascist power grabs they keep wanting. We have doctrinaire liberal civil libertarian Noam Chomsky pointing out the FACT that Barack Obama is worse than George Bush EVER was in violating American’s civil liberties. We’ve got the liberal “journalist” Piers Morgan pointing out that the liberal editorial board of the liberal New York Times stating for the record that Obama is far worse than Bush ever was. The ACLU released a report that states that Obama is worse than Bush was on violating civil liberties. Now, I could go on and on, but it is a FACT that Barack Obama has violated our civil liberties and violated the Constitution on a scale never witnessed by any US president. But chillingly, all of the above people and organizations I cited above would vote for Obama again and a Democrat WORSE than Obama in a heartbeat in any national election rather than EVER vote for a Republican. It’s just who these people are. Obama mocked us for clinging to our guns and religion, because after all the Constitution guaranteed freedom to have BOTH; liberals are people who cling to their homosexuality and their baby-murdering abortion mills. And according to Romans chapter one, that is why the beast is coming. The Book of Revelation, chapters five and six, clearly present the Antichrist as the judgment of a wrathful God who finally gives the godless people the leader they truly deserve. We have in Barack Obama a beast preparing the way for THE beast. And if you voted for Obama, if you are a Democrat, you have already indicated that you will vote for the coming Antichrist, the true beast. Because you have already demonstrated that you want what the Antichrist will bring: increased government power over the people in the name of implementing a Utopian agenda. Fortunately for me and mine, an event called “the Rapture” as described in 1 Thessalonians 4:13–18 and 1 Corinthians 15:50–58, will happen prior to the coming of the Antichrist and the Mark of the Beast. There will be Christians aplenty during the Seven Years Tribulation that God has decreed prior to the Second Coming of Christ as King of kings and Lord of lords, but they will become Christians after the Rapture – when people they knew who told them about the Blessed Hope will suddenly and without warning literally seem to disappear from the very world. Tell me if that doesn’t sound like something you’ve heard is going on these days. These last days just before the Rapture with the Tribulation coming right on its heels and you will die a horrible death if you don’t take the mark of the beast and you will burn in hell for all eternity if you DO take it. If I have yet hold on to a spirit of anger due to the pathetic disgrace that is preceding the last days – which I confess as sin simply because God told us in His Word that this great falling away, this terrible apostasy, would come first – I do NOT have a spirit of fear. And that is because I know I won’t be here when the same world that so welcomed and celebrated Obama will welcome and celebrate the coming beast. Lord Jesus, I offer this prayer to the Father right now, even for my enemies, that they would see the terrible error of their ways and embrace You before it is too late for them to be caught up with You in the Rapture. For the rest of you, this world is already starting to truly heat up as it prepares to descend into hell. Democrats probably LOVE to say, “Republican Arnold Schwarzenegger.” And why wouldn’t they? The man is a turd. That said, this turd – who emerged from elite liberal Hollywood – became “Governator,” was very quickly broken by Democrats, and went from calling Democrats “gurly men” to bending over for the gurly men. Arnold stands for homosexual marriage, the culture of abortion, the Dr. Mengele-like exploitation of embryos in the name of “science,” and pretty much every OTHER liberal wedge issue. Which means calling him a “Republican” is kind of like calling ubersocialist Barack Obama a “Republican.” Give me a break. But the disgraced turd who is so unfaithful and so hypocritical that he not only cheated on his wife, but cheated on the woman whom he was cheating on his wife with is back. You know, like his “I’ll be back” line that he said in pretty much every movie he ever appeared in. The National Climate Assessment presents a sobering vision of the world that awaits us if we don’t act. I will always remember the day I woke to the news that more than 2,000 fires were burning in California. I thought I must not have heard correctly. Two thousand fires? How could that be? In the end, the state’s brave firefighters, joined by contingents from out of state, won the battle. But not before 11 emergency declarations were issued and more than 400,000 acres burned. Countless lives and livelihoods were ruined. Today, there’s a new disaster looming, and although it’s not as riveting or dramatic as walls of flames and billowing black smoke, it needs our immediate attention. The draft National Climate Assessment, now being circulated for comment and scheduled for release this year by the U.S. Global Change Research Program, presents a sobering vision of the world that awaits us if we don’t act. This team of top climate scientists has concluded that our region of the country is hotter than it has ever been and that it will get hotter — because of humans. The last decade was the hottest the Southwestern U.S. has experienced — on average 2 degrees warmer than it had been historically. The scientists project a further increase over the next 50 years of 6 to 9 degrees if we do nothing. Already we are seeing the effects of a warmer climate: droughts and heat waves that threaten lives, and, yes, fires. This shift could spell disaster for California, long the nation’s agricultural powerhouse. The state produces more than half of the fruits, nuts and vegetables grown in the U.S., with an output of $43.5 billion last year. Californians don’t rely just on the food produced by the state’s farms; they rely on the revenue and the jobs too. Agriculture employs more than 1.5 million people in California. This report spells out many other negative effects that rising temperatures will cause in California. Over the last 100 years, sea levels have risen about 7 inches, and the San Francisco Bay Area is already feeling the effects. A sewage system there was flooded with saltwater, and the 101 Freeway has seen flooding. This isn’t a distant threat. Now, we are facing another rise in sea level of 1 to 4 feet. A rise of just 16 inches would be enough to endanger roads, highways and airports in San Francisco and Oakland. It could contaminate crucial groundwater in Los Angeles. Heat is already the leading cause of weather-related deaths, and the expected temperature increase will mean longer and hotter heat waves, like the one that killed 164 Californians during a blistering week in 2006. That’s the bad news contained in the National Climate Assessment. The good news is we can do something to prevent these dire outcomes. The report should be a wake-up call for leaders in Washington to overcome gridlock and start working on solutions. For models of how to proceed, they need only look to California and other states and cities that have begun to move forward in a bipartisan way. The first step for policymakers — and for ordinary citizens too — is to understand the situation we face, which means carefully reading the National Climate Assessment. It may not be as gripping to look at or have the provocative appeal of a raging wildfire or another act of God, but the knowledge in this report is crucial to understanding how to change, to adapt, to prevent and to prepare for future disasters. Climate change. Global warming. Whatever these pathological liars will label it next. It’s killing us. We’re all going to die. First of all, if you think the Los Angeles Times would have published Turdzenegger’s screed if he had said global warming was an idiotic myth, you’re a breathtaking idiot. Nope, the ONLY way Turdzenegger can get back in the public’s good graces is by trying to preach the liberal line. And of course to get his lines LEFT rather than right. But the day that Turdzenegger said “Heat is already the leading cause of weather-related deaths” turned out to be a uberCOLD Spring day in California. As Turdzenegger screamed that it was just getting hotter and hotter, I looked at my thermometer: it was in the forties. By 11:00 AM, it was 51 degrees Fahrenheit. Blizzard warnings were in effect Tuesday in Colorado, where the temperature plunged more than 50 degrees in less than 24 hours and the wind chill approached zero. Forecasters also expect hurricane-force blasts of frigid air in Utah and heavy snow in the Dakotas. The culprit is a deep dip in the jet stream that swung west and pulled arctic air far into the country. As it collides with warm, moist air from the Gulf of Mexico, strong storms and tornadoes are possible in the Great Plains and Texas. “It’s just brutal to be outside,” said Eric Fisher, a meteorologist for The Weather Channel. In Denver, the temperature plummeted from 71 degrees at 2 p.m. Monday to 16 degrees at 7 a.m. Tuesday, with a wind chill of 1. More than 300 flights had been canceled into and out of Denver since Monday night. Forecasters said Denver could get as much as 11 inches of snow and South Dakota more than a foot, with snow stretching as far north and east as Minnesota and Nebraska. In Utah, wind gusts of 75 mph were possible, The Weather Channel reported. The calendar may say spring, but April is the second-snowiest month of the year in Denver. The city has averaged 9 inches in April since 1882, second only to the 11.5 inches it gets in an average March, according to the National Weather Service. The weather pattern threatened to bring damaging wind, large hail and perhaps tornadoes to parts of Texas, Oklahoma, Nebraska and Iowa, and weaker storms later in the day in the Ohio Valley. “We’re looking at the gamut today for severe weather,” Weather Channel meteorologist Kevin Roth said. As the system moves east, severe storms are possible Wednesday across a boomerang-shaped swath of the country from the Texas Gulf Coast north through Indiana and into western Pennsylvania. Severe storms could move into Georgia, West Virginia and the Carolinas on Thursday. This is a common event. Oh, yeah. All the time. Pretty much every damn year. You can count on it. Every year. Including this year right here in our capitol. Remember when global warming idiots brazenly said that “snow is starting to disappear from our lives”??? Seriously, do you remember this crap? What’s that? You idiots DON’T remember this? We are at a point of global stupidity when these fools can be wrong a thousand times and still win the argument with an intellectually moronic and morally idiotic culture. The Arctic ice returns to normal, in contradiction to the liberal demagogues. But the liberal lies go on and on. And on, of course. That’s what “global warming” really proves, of course: that liberals are abject liars who will stop at nothing. When we get the most snow in a hundred years, why is it? Because it’s so damn hot it’s actually cold. I’ve repeatedly described “climate change” events that preached global warming that had to be canceled because it was way too damn cold to have the event. I’ve explained that in contrast to what the global warming alarmists keep screeching, global temperatures are PLUNGING. And while we’ve dumped more CO2 into the global atmosphere in the last ten years than during ANY time in history, there is no correlating rise in temperature to show for it. I’ve pointed out that the shenanigans that the left have pulled off in the name of “climate change” has been bogus fraud after fraud after fraud. It turns out that if you actually factor in the environmental, CO2-spewing costs to the environment of producing and disposing of the batteries for the electric cars, they are actually FAR more polluting than the gas-guzzlers. I’ve pointed out how the “scientists” keep being wrong in their hyping over global warming. As well as how they have repeatedly warped legitimate science to hype it. As in they’ve done it and gotten caught doing it over and over and over again. Which of course very much includes the abject scientific fraud that is Obama. That’s right, I said Obama is a fraud and a liar. As well as the vile tactics that liberals will go to to ignore “science” so they can hype a blatantly false message. Global Warming is a pseudo-scientific fraud. Period. I’ve pointed out the tragic tendency of liberals to believe whatever “science” tells them – no matter how monstrous the message they are asked to believe. Which is why the left wants to murder hundreds of millions of precious human babies in the global abortion mills by depriving humans of their humanity while giving “Mother Earth” the status that they deny to actual human beings. I’ve explained that there is NO scientific reason to embrace “global warming” by whatever name the libturds want to call it. I’ve pointed out that legitimate science actually documents the fact that – in utter disproof of “man-cased global warming,” the temperatures in the pre-industrial world were considerably WARMER than they are now. I’ve also written about what the TRUE monstrous agenda of the left is – over global warming and pretty much everything else. Just read the quotes near the bottom of the article to see how profoundly demonic and anti-human the global warming lobby truly is. I’ve explained that “global warming” and sky-high gasoline prices go hand in glove. Oh, yes, and energy prices, too. I just learned that the Old Kingdom of Egypt began as a result of an enormous climate shift in which Northern Africa went from a verdant and fertile land to a desert while the Nile began to bloom (4000 BC) and collapsed as a result of massive climate change in which the Nile transformed from lush farmland into dust. And nobody was driving SUVs, were they??? Just as nobody is driving SUVs on Mars. The fact of the matter is that it was never anything more than a completely artificial and arbitrary decision to blame manmade CO2 – which constitutes such a tiny infinitesimal fraction of the actual global warming gasses it is unreal – for all of our current climate change. When manmade CO2 very obviously never had ANYTHING WHATSOEVER to do with all the myriad episodes of climate change that have characterized the history of planet earth from time immemorial ever before. But liberals swear up and down that we must spend at least $76 trillion to fight the manmade CO2 bogeyman regardless. Again, what caused the collapse of the Old Kingdom in Egypt? “Climate change.” Either because those damned pharaohs were driving around in pollution-spewing SUVs and pickup trucks, or in complete refutation of everything liberals are trying to say now. And the fact remains that the Roman Empire was able to become great at a time when temperatures were considerably warmer than they are now. In complete refutation of everything liberals are trying to say now about the horrendous danger of global warming. And, again, where are the reports of the SUVs and pickup trucks being found by the millions on MARS? History refutes them. Which is why “history” is such an unimportant subject to the left and why they always want to rewrite history. And it doesn’t matter how many jobs these leftists destroy. They talk about caring about the poor, but they don’t give a damn about actual people. The actual major polluters get a complete pass from the left. China, India and Russia can go on polluting; it’s only the WEST that must stop. Why is that, if there’s an actual crisis? The fact is that the true agenda of the left – whether about “global warming” or anything else – is the worship of Satan rather than the God of the Bible and Marxist redistributionism. And liberal progressive “science” was at the heart of the last Holocaust, just as it is at the heart of the present one. For the record, I DO believe that the climate is changing. I believe what legitimate science has actually already proven: that changes in the sun trigger changes in our climate, and all the liberals who say that human beings can control the earth’s climate have redistributed bovine feces into their skulls. What is interesting is that Jesus and the prophets in the Bible were the ones who talked about crazy climate changes in the last days. Liberals have hijacked an issue that proves that we are in the last days as they strive to bring the very last days that the Bible described to come to pass. (CBS News) – Tax return fraud is a growing problem, with more than two million bogus returns filed last year with the Internal Revenue Service – returns filed by thieves who had stolen people’s identities. This type of crime is exploding because of two factors: online companies like Turbo Tax make filing taxes fast and easy; and the IRS, in an effort to get refunds out quickly, does not cross-check the returns against employers’ payroll records. To exploit that, scammers buy lists of names and Social Security numbers of living people on the black market, and troll Internet family support sites to steal the identities of the dead. In just three years, tax refund fraud has increased by 700 percent – with $2 billion in tax dollars paid out to thieves last year alone. In December 2008, Terry and Stephanie McClung welcomed their daughter Kaitlyn into the world. But just five months later, they lost her to sudden infant death syndrome. The McClungs’ grief was compounded by shock when they discovered someone had stolen their daughter’s identity, and claimed her as a dependent for the $1,500 it would add to a fraudulent tax return. Or take the case of Sgt. Adam Ray – a West Point graduate killed by an IED in Afghanistan. Scammers filed his tax returns and had the refund issued directly to a green dot debit card from a Georgia bank. How much is the IRS paying out to people who are not the taxpayer? Note that under the three failed years of Obama, government incompetence has increased by 700 percent. Years before Climategate, THAT email, from Phil Jones to Warwick Hughes told us everything we needed to know about the scientific standards at the Climate Research Unit of East Anglia. THAT email was the tip of the iceberg, and below is what lay underneath the surface — the things that were said behind the scenes at the time. Geoff Sherrington has pieced together a sequence of climategate emails, his own emails, and parts of Warwick Hughes work to recreate the sequence. And for the true skeptic-aficionados, here’s a new layer of history to the skeptical chronology. Where did this volunteer audit movement begin? Who would have guessed that at least one skeptic, Hughes, was asking for the data Phil Jones worked with, as long ago as 1991? (That was way back in the days where people worked with hard copy print outs, and drew graphs by hand!) Does Hughes rank as volunteer Skeptic Number 1? Guest post by: Geoffrey H Sherrington, Scientist. This is the longer story behind one of the more anti-science quotes in the short history of people attempting to be ‘climate scientists’, definition unclear. The pivotal short quote is in the opening email. Original artwork: McCutcheon 1903. Adapted: Jo Nova. Here is a series of emails and articles with my interspersed comments in italics. Each email number is the one assigned in Climategate One and Two, presumably by the donor named FOIA. The Climategate emails are indented below, so the source can be picked up easily. There are sections cut from other emails as well. They are not indented. We start with the famous email, the one that some say was the start of the difficulty that scientists in general found when they tried to access data from some climate scientists. From Phil Jones to Warwick Hughes. I should warn you that some data we have we are not supposed top (sic) pass on to others. We can pass on the gridded data – which we do. Even if WMO agrees, I will still not pass on the data. We have 25 or so years invested in the work. Why should I make the data available to you, when your aim is to try and find something wrong with it. There is IPR to consider. You can get similar data from GHCN at NCDC. Australia isn’t restricted there. WMO = World Meteorological Organisation. IPR = Intellectual Property Rights. GHCN = Global Historical Climatology Network. NCAR = USA National Centre for Atmospheric Research. WWR = World Weather Records of the World Meteorological Organization. MCDR = WMO’s Monthly Climatic Data for the World. Phil had had some prior thoughts about this. The reason for emailing though is that I’m also being hassled by Warwick Hughes for the CRU station dataset. We put up the gridded fields, but not the station data. Over the last year or so, I’ve told people they can’t have the station data – go to the GHCN site and get it. I knew that avenue has been closed, but it got some of them off my back. I’m not that inclined to release it to Hughes (who Mike knows and maybe Tom). All he wants to do is to show how I’ve made some mistake or used some incorrect data for some stations. 1. Should Res. 40 stop GHCN data being released? 2. Should I be hiding behind it too? 3. When does IPR kick in with the work I’ve put in on the CRU data? 4. Should people like this be able to request this kind of data? 5. NCAR release a precursor to GHCN – just WWR/MCDW+lots of other data, but in an unfriendly format. From Phil Jones to Tom Peterson. Jones seems to be unsure of the efficacy or legality of ways to avoid a direct answer to Warwick Hughes. Jones appears to know that he is deliberately telling people to go to a place where they will not find the answers they seek. Note the term “unfriendly format”. Why was Warwick Hughes seeking certain data in 1990? They gave me a little cubbie of a desk and a 286 PC with Win3.1 and I began pestering staff as to how to get some work out of this box thing. Anyway – the worst phase probably only took a few weeks and I could get some work out of Excel – my early data was entered to disk from my sheaf of hard copies printouts. Sometime in winter 91 I made contacts in the BoM and somebody gave me a copy of the US DoE TR027 report – which details – station by station – Jones et al Southern Hemisphere compilation of GW. About a half dozen people or more, like me, from larger companies, would meet monthly to distribute funds to Tasman and to review work in progress. Warwick made a presentation in 1991-2. He was more prescient than I was. I left the climate scene early in 1993 and did not reconnect until about 2005. The work presented to Tasman Institute contained several graphs. These two persist, see http://www.warwickhughes.com/1991/targw.htmfor a longer discussion. Top graph: Geraldton, Narrabri, Hay, Albany, Rottnest Island Lighthouse, Walgett, Deniliquin, Bourke, Cape Naturaliste Lighthouse, Coonabarabran, Echuca, Cooma, Darwin, Moruya Heads Pilot Station, Omeo, Dubbo, Alice Springs, Gabo Island Lighthouse, Bathurst, Strathalbyn, Mt. Gambier, Yamba, Wilsons Promontory Lighthouse, Newcastle Signal Station, Cape Otway Lighthouse. It was Warwick’s contention that the search for UHI had been less that thorough as to choice of Australian stations. Here he shows that the temperature change in the average of several large Australian cities was positive, whereas that of a selection of rural sites was negative to level. (Temperature is in Celsius, Tmean annual compiled from half of the sum of Tmax and Tmin daily). Somehow, Phil Jones had concluded from figures similar to these that UHI was negligible in Australia, a finding that is still being quoted in 2011. 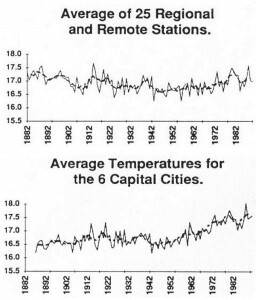 Jones, P. D., S. C. B. Raper, T. M. L. Wigley, 1986: Southern Hemisphere Surface Air Temperature Variations: 1851–1984. J. Climate Appl. Meteor., 25, 1213–1230. This second paper dealt with data from China, Russia and Eastern Australia and it was one of the key papers promoting a stampede of thought under the Global Warming banner. It is an important paper, but it is wrong. Warwick subsequently had the following papers published and a few more rejected, perhaps because they questioned the orthodoxy. 1995 Robert C. Balling, Jr. and Warwick S. Hughes. “Comments on “Detecting Climate Change Concurrent with Deforestation in the Amazon Basin: Which Way Has It Gone ?” Bulletin of the American Meteorological Society, Vol. 76, No. 4, 9. 559. 1995 Warwick S. Hughes. Comment on D.E. Parker, “Effects of Changing Exposure of Thermometers at Land Stations.” International Journal of Climatology, Vol. 15, pp. 231-234. 1997 Warwick S. Hughes. Comment on, “Historical Thermometer Exposures in Australia.” by N. Nichols et al. International Journal of Climatology, Vol. 17, pp. 197-199. “THERE is an excellent argument for curbing the public statements of scientists like those from CSIRO, a former employer of mine. Scientists, like the public, cover a spectrum of beliefs, some of which are based on emotion rather than science. An example is the selection of Australian weather recording sites used to construct the temperature measurements of the continent, which play a big part in southern hemisphere weather models. From the beginning, most sites that showed little or no temperature rise or a fall from, say, the 1880s to now were rejected. The few sites selected to represent Australia were mainly from capital cities and under suspicion for “heat island” effects. I could give example after example as it was one of my employment functions to distill the best results from the bogus on many mattersrelated to energy/greenhouse/nuclear etc. I found few truly objective submissions among those masquerading as science.” Geoffrey H Sherrington. This created a storm, because the Climatic Age of Innocence in Australia was again under threat. Also, I sent emails to Phil Jones. These are too long to reproduce in full, so later I collated them for the Climate Audit blog. The first one starts a few paragraphs down from here, datde 24 March 2006. The “missing graphs” to which I refer are those in the text just above here. The Jones+Sherrington email exchange is not in the Climategate sets. Two recurrent themes are the evasion of a direct answer by Jones; and as we shall now see, the way in which data disappear, reappear, are available, are not available, are reliable, are not reliable. This might seem like fun, but it is not like Science. At about this time, the subject of Freedom of Information law, especially in Britain, started to become mentioned more often. From Phil Jones to Tom Wigley, CRU. On the FOI Act there is a little leaflet we have all been sent. It doesn’t really clarify what we might have to do re programs or data. Like all things in Britain we will only find out when the first person or organization asks. I wouldn’t tell anybody about the FOI Act in Britain. I don’t think UEA really knows what’s involved….. I got a brochure on the FOI Act from UEA. Does this mean that, if someone asks for a computer program we have to give it out?? Phil Jones to Tom Wigley, CRU. Most of the following is self-explanatory parts of emails from Climategates One and Two. we used when we began our study in the mid 1990s. Ooh! Are we being scolded? – “OH F— THIS. It’s Sunday evening, I’ve worked all weekend, and just when I thought it was done, I’m hitting yet another problem that’s based on the hopeless state of our databases.” (241). Having established some reason to doubt the accuracy of the CRU data, we turn now to the “now you see it, now you don’t” aspect. Here is my first attempt to gather data from CRU. It overlaps with Warwick’s requests. This is not in the Climategate emails, it is personal. From Geoff Sherrington to CRU. I seek the figures which were used from Australian weather stations at the start of your climate modelling work in the 1980s. I seek to know the first set of Australia weather stations used in modelling, plus the set that was rejected and if possible, the span of data by years (or the data itself) for each of the stations considered and eventually used initially. Is it possible to obtain this information? From CRU to Geoff Sherrington. Dear Geoffrey, We no longer have the Australian station date we were using in the early 1980s. At that time we had a limited network. In the 1990s, the Australian Bureau of Meteorology began issuing a lot more station data each month. Up to that time it had been about 40 stations internationally. Through contacts with personnel in Melbourne, we got access to the back data from all the new stations, so added these. 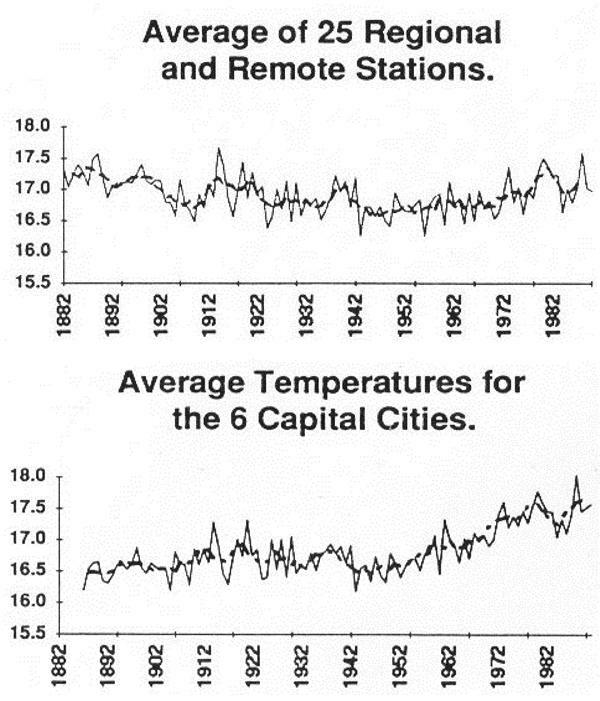 In order to use temperature data, we need historic series with at least the 1961-90 base period. We now have access to over 100 stations from BoM in real time … Australia is the only country to make additional data (additional to the about 1500 exchanged by Met Services) to us in real time. Warwick tried to get information from the USA Government. This related to the first main paper quoted above, from data collected by CRU for the US Government, who paid Phil Jones & Co on an ongoing basis. The response was negative. Phil Jones tells others that an Australian BOM officer is ignoring Climate Audit and Warwick Hughes. From Phil Jones to Tom Wigley. Keenan he was going to Norway for a meeting. Maybe he’s back now. It seems as though they didn’t give him much time to respond. read the paper beyond the abstract and the urban section. be ignoring anything on CA and anything from Warwick Hughes. CA = Climate Audit blog. SST = Surface Sea Temperature. UHI = Urban Heat Island. (Natural temperatures artificially elevated by man-made developments near weather stations). The puzzle deepens. Phil had the data after all! Phil Jones to Thomas Karl NOAA USA. and move onto something else. them to the pre-1960 period. By the way, I do have the data from the study on disk! I was wise even when Steve McIntyre first requested the data many years ago. I think I could replicate the study if I had that rare commodity – time. Tom – thanks. It even has pre-IPCC definitions of likelihood! Neil – can you pass this on with my best wishes to Mike. CLIMAT = a collective system of periodic climate reporting by countries under an arrangement of the World Meteorological Organization. From Phil Jones to Dave Palmer, FOI officer, CRU. keep them quiet, or just spur them into more requests? Phil loses data – again. Reported in “Guardian” newspaper. 15 February, 2010. “In an interview with the science journal Nature, Phil Jones, the head of the Climate Research Unit (CRU) at the University East Anglia, admitted it was “not acceptable” that records underpinning a 1990 global warming study have been lost. The missing records make it impossible to verify claims that rural weather stations in developing China were not significantly moved, as it states in the 1990 paper, which was published in Nature. “It’s not acceptable … [it’s] not best practice,” Jones said. I cannot understand what Phil means, as he has previously stated in 3114 , three years before, that the data are not lost. Then we get this expose. The Australian data have a serious error in any case. From Phil Jones John Kennedy, a Canadian official, by way of mention. issuing the wrong CLIMATs as far mean T is concerned. whole by +0.15C compared to what is released. discovered that the reversion never happened. (and local sunrise/sunset times) within their time zone. Perhaps this is a good end point. It shows that CRU and some of its people were unprepared to participate in the normal conduct of science; that they tried to thwart progress; that they invented reasons to explain disarray of their data, which disappeared and reappeared episodically; that they were prepared to flaunt Freedom of Information laws; that as Harry the programmer wrote, they were prepared to fabricate data; that they were manipulative; that they were Hell-bent on pushing a cause to the extent of rejecting wise counsel. Perhaps, in regard to the start of this article, Warwick should have asked “Are your data worth having” before he asked if he could have some. There is good case that they were wrong then; and that they are wrong now, 2 decades later. This makes an appropriate ending to my piece. Disclaimer: Apart from verbatim quotes by others, views expressed in this guest post are those of the author. *Of course Sherwood Idso, Richard Lindzen, Roy Spencer, John Christie, Pat Michaels etc were all skeptics tackling this from professional positions at the time. “Why should I make the data available to you, when your aim is to try and find something wrong with it,” asks the global warming “scientist.” And the answer, of course, is “Oh, I don’t know, BECAUSE THAT’S WHAT LEGITIMATE SCIENTISTS DO!!! as well act as expected. They will run out of steam in a week or two and move onto something else. Is the following a legitimate way to deal with incredibly important issues of “science”? Should I be hiding behind it too? is the kind of question any legitmate scientist representing any kind of legitimate field ought to ask? Oh, well, I guess we’ve got no choice but to accept their conclusions and spend the $76 trillion the United Nations says we need to spend. All liberals and Democrats shall henceforth reduce themselves to abject poverty paying for this boondoggle first. This is an excellent piece that just damns these false prophets (because the term “scientist” is a category fallacy with these frauds) with their own words. Well, shoot. Al Gore says it’s true, and he won a Nobel Peace Prize for SCIENCE. It doesn’t matter if that man is an abject scientific fraud, too. “Global warming” was bogus, so they called it “climate change” as if changing the name would change the fact that it is bogus by ANY name. Not only is global warming a religion, but it is a religion that is so pathologically stupid and dishonest the priests purged their own sacred texts rather than submit them to critics. I would suggest that you click on the article link and read it there as the formatting is better than my copy/paste. Turning The Tables On Vicious Rolling Stone Leftist Attack Piece On Michelle Palin (Among Other Things, They Plagiarized). There was a particularly vicious leftwing assault by leftwing rag The Rolling Stone. The only time I ever hear anything about Rolling Stone Magazine is when they do something particularly vile, because on their best day they are still vile and so why read them? Their last infamous hit piece (on General Stanley McChrystal) was also filled with fraud. But what can you say? Liberals are people who swim in an ocean of lies; and why should they be troubled when the people they trust to lie to them turn out to be dishonest??? 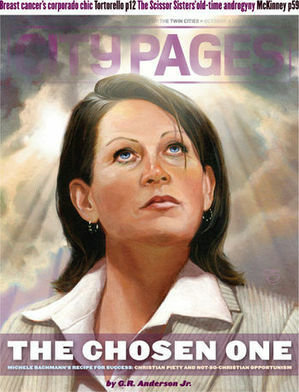 There are such lines in the Rolling Stone piece as “Bachmann is a religious zealot whose brain is a raging electrical storm of divine visions and paranoid delusions.” I don’t need to read further than that. It was a toxic, rabid hit piece by toxic, rabid secular humanist liberals. It’s been a few months since we’ve had ourselves a good-old plagiarism incident to get riled up about. But thanks to Rolling Stone, our sleepy summer Friday just got a bit more scandalous! The magazine is taking some heat today for lifting quotes in Matt Taibbi’s hit piece on Minnesota’s 2012 Tea Party hopeful Michele Bachmann. At least one plagiarism “expert” doesn’t buy Bates’ logic. We emailed Taibbi, who is no stranger to press controversies, with a request for comment and will update this if we hear back. In the meantime, Anderson is giving Rolling Stone the benefit of the doubt, although he didn’t let them off the hook entirely. You can check out a side-by-side comparison of the two Bachmann profiles over at The Awl. 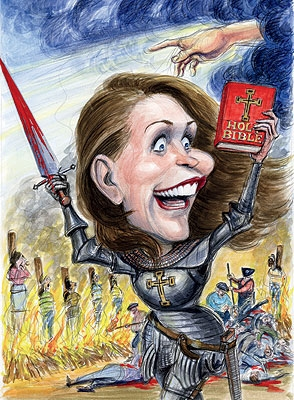 What is particularly ironic is the use of an image of Michelle Bachmann as holy warrior, gripping the Bible in one hand and a sword dripping in blood in the other as a bloody slaughter continues unabated in the background. It’s an image that is intended to summon the most grisly spectre of the Crusades, of course. At the worst of the Crusades, the “Christian warriors” were given Absolution for their sins for taking part in the Holy War. You could literally get away with murder. And too many did just that (at least until they found out the hard way that the Pope’s absolution didn’t give them absolution from a just and holy God). Now, let us consider the irony of the “Absolution” given by the left. Women are sacred cows (now watch me get attacked as calling women “cows”) in liberalism. You do not DARE attack women. Unless they are conservative women like Sarah Palin and Michelle Bachmann. And then liberals are given total Absolution to attack them as women, as wives, as mothers, as sexual beings, as anything that smears them and degrades them. And they have absolution to do it; no women’s group will come after them. Their sins are pardoned. Call it a leftwing Crusade; better yet, call it a leftwing jihad. “Kill thee all the enemies of liberalism. Nullus Dues lo volt! [No God wills it!]. Thous hast absolution to murder thine opponents by any means necessary!” And off these “journalists” (or JournoLists) go to do their demonic bidding. A similar case of such liberal Absolution just occurred with Jon Stewart, who mocked black conservative Herman Cain in an obviously racial and racist manner using his Amos and Andy voice. It’s fine; a Jon Stewart liberal can openly racially mock a black man, provided that black man is a conservative. It’s no different than the most cynical criticism of Pope Pius in the Crusades, who said it was okay to murder as long as you were murdering a Muslim. We see their “objective” work when they flood to Alaska to search through tens of thousands of Sarah Palin emails and even enlist their readers to help them dig for dirt. They never would have DREAMED of subpeoning Barak Obama’s emails. We see their “objective” work when they trip all over themselves to buy a story about a bogus lesbian Muslim heroine (i.e. more liberal fraud) just because she was lesbian and Muslim, and that’s exactly what they wanted to see. I would love nothing more than to have all the Western “journalists” who have played these games grabbed up and taken to a country governed by Islam and watch the look on their formerly smug faces as they were tortured and killed one after another. Until that day, they will continue to serve as useful idiots for communism and terrorism and pretty much every other “ism” that is eroding Western Culture from within. Add that abject hypocrisy of the left to the fact that for a writer anything resembling plagiarism is the greatest sin imaginable, and you get to see just how utterly vile these people are. They have no honor, no integrity, no decency. Period. And then we compare the sheer number of plagiarism cases at leftwing papers such as the New York Times (I’ll just drop a couple of names like Jayson Blair and Maureen Dowd and Zachery Kouwe) to conservative papers like the Wall Street Journal, and you see which side simply has no honor, integrity, or decency at all. But what should we expect from such a rabid little bunch of Goebbels? Honesty? It is also interesting to add that the Crusaders were in fact responding to CENTURIES of Muslim aggression. While many of the monstrous acts that occurred on both sides could never be justified, “the Crusades” themselves were quite justifiable. I make mention of this because the left continues to do to the Crusades what they are doing even today; take the side of the aggressive vicious murderers against Western Culture. And when you look at a major rundown of major plagiarism cases in journalism, it’s the leftwing names like the Washington Post and the Boston Globe and ESPN rather than Fox News. When America is sufficiently toxic and ripe for judgment, it listens to lies and the bad people who tell those lies and votes for Democrats. That’s basically where we seem to be now. Oh, by the way, Barack Obama is a documented plagiarist, too. That’s part of the reason liberal journalists love him so much; he’s truly one of them.